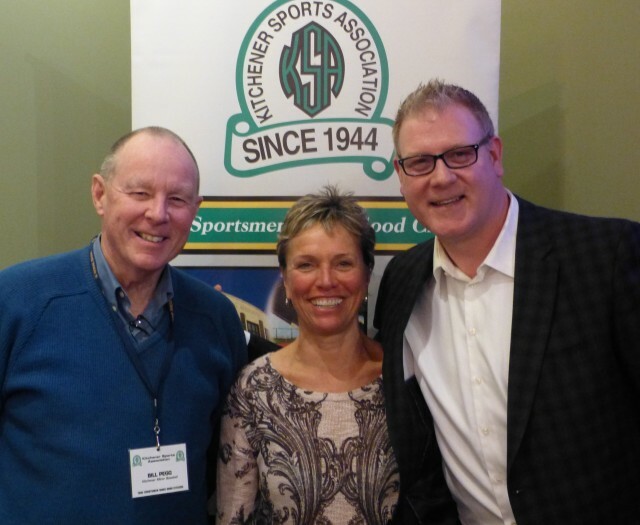 Updated Sunday December 7, 2014 by Kitchener Sports Association. PHOTO: KSA President Bill Pegg, Minto Schneider (General Manager at Waterloo Regional Tourism Marketing Partnership) and Laurence Bishop (Director, Regional Sport Tourism Office). Minto introduced Laurence at KSA's Feb. 18 (2014) dinner. Laurence is. looking forward to working with local sports groups and the hospitality industry to promote the area as a sports destination. "Sports Tourism in the Waterloo Region"
We welcomed the new Director of Sport Tourism, Laurence Bishop and Minto Schneider (General Manager at Waterloo Regional Tourism Marketing Partnership). With their help and guidance, the objective is to raise the area's profile to the top of the "Tier 2" list of Ontario destinations for the hosting of sports events. Laurence pointed out that the Region already has the venues, rooms and restaurants - we just need to inventory the resources and work together in a coordinated effort to bring more sports events to this area. Sports tourism is a hugh business and it's time for this area put up a bigger notice that we're geared up and ready. It was also pointed out that hosting a tournament is not only good for local businesses but also generates interest in the sport and, most often, increased registration numbers.